Product Condition: The Mazama 2 Trail Running Shoe - Women's is in Excellent condition. These shoes were previously owned for three weeks. The following observations were made regarding these item. *They were used for an occasion. *There aren't any defects in them at all. *They got minor pet hair inside, cleanable. *All items sold as is, all warranties void. Despite all of our PBs, fat-burning dietary endeavors, and endless training, we can't all be like the Tarahumara. 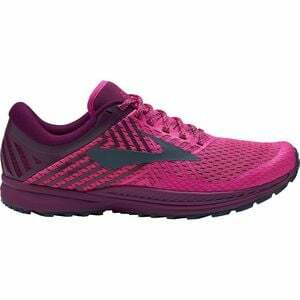 However, after an ego-crushing uphill jaunt, the Brooks Women's Mazama 2 Trail Running Shoe can certainly make you feel as though you were born to run freely and effortlessly. Brooks' lightest trail running shoe, the Mazama 2 features a barely-noticeable, breathable, and supportive upper that's outfitted with a DWR treatment for protection against puddles and light precipitation. To further bolster its title, the Mazama 2 features a removable foam insole that allows you to customize your support should you require it, while the BioMoGo DNA midsole is highly adaptive and responsive, ensuring impact absorption from mile one all the way to mile 11. The Propulsion Plate cultivates a stable platform from which you propel power transmission, and is further supported by the full-length segmented Crash Pad which ultimately ensures a fast heel-to-toe transition so you can make the most of your stride. Additionally, a decoupled midfoot allows for an au-natural, flexible feeling when it comes to tackle rocky and technical terrain, and the rubber outsole is equal parts sticky and grippy, so you're able to put the pedal to the medal and go for that PB, even if you aren't a Tarahumara.